We Offer Water Parks such as bumping boats, Rapid River Rides Tube and Hara Kiri Ride. The Inflatable tube is manufactured from heavy duty nylon fabric coated with hypalon for u.v resistance. 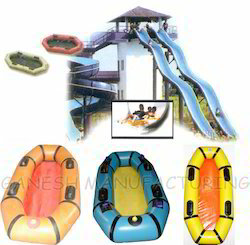 We have received much appreciation from our clients for offering durable collection of Rapid River Rides Tube. Rapid River rides can be very comfortable with features like cup holders. 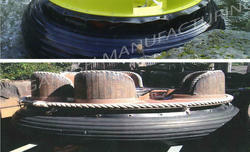 The tubes of Rapid River Rides are very agile and durable for your adventures. Tubes are manufactured from Heavy duty, high strength nylon fabric special Rubber coated for U.V Resistance. We have introduced ourselves in the production of unmatched array of Hara Kiri Raft using 1000 denier UV resistant "double-thick" polyamide reinforced hypolon & neoprene. Our range is customized to the individual choices of the clients. These are suitable for commercial recreation. Each sled is hand made using glue bonded overlapping seams. A double layer padded floor on the bottom. Molded strong handles and Non return valves are fitted. Perfect for recreation, Ganesh Manufacturing has sold Thousands of these durable Slide Rafts to Water parks in India & Asian Countries. Looking for Amusement Park Products ?